Before 1716: born in Kamigata. His adoptive father was Kobayashi Shinsuke, a mechanized puppets master. 1716 ~ 1717: he started his career as a disciple of Shinozuka Jirozaemon I, who gave him the name of Shinozuka Sôjûrô. 23rd day of the 1st lunar month of 1718 : his master Shinozuka Jirozaemon I died. 11th lunar month of 1721: Sôjûrô performed as a tachiyaku in Kyôto; he played the role of Irienojô at Hayagumo Chôdayû's theater in the kaomise drama "Fuji Asama Taiheiraku", which was coproduced by Wakaura Kinjûrô and Matsumoto Shigemaki. Fall 1722: Sôjûrô went to Ôsaka. 11th lunar month of 1722: Sôjûrô became jitsuaku and performed in the kaomise drama "Tenchi Tennô Sokutai Guruma", which was produced by Arashi Kanshirô I. 1st lunar month of 1723: Sôjûrô played in the same theater the role of Date no Kitôta in the new year ni-no-kawari "Keisei Tomoe Daiko". 11th lunar month of 1723: Sôjûrô became katakiyaku and performed at the Naka no Shibai, in the kaomise drama "Chûshin Futaba no Matsu", which was produced by Matsushima Hyôtarô. 1st lunar month of 1726: he became jitsuaku and took the name of Shinozuka Kazaemon. 11th lunar month of 1726: Kazaemon played at Kameya Kumenojô's theater (Kyôto) the role of Shirakabe Heima in the kaomise drama "Karanishiki Imose no Shitone", which was produced by Matsushima Hyôtarô. 1st lunar month of 1727: Kazaemon's rank in the Kyôto hyôbanki, jitsuaku section, was jô-jô (superior - superior). Fall 1729: Kazaemon went to Ôsaka. 11th lunar month of 1729: Kazaemon played at the Naka no Shibai the role of Hakozaki Sasaemon in the kaomise drama "Daimyô Yakata Manpô no Mikura", which was produced by Anegawa Shinshirô I. 1st lunar month of 1730: Kazaemon's rank in the Ôsaka hyôbanki, jitsuaku section, was jô-jô (superior - superior). Fall 1729: Kazaemon went to Kyôto. 11th lunar month of 1730: Kazaemon became katakiyaku and played in Kyôto the role of Sengoku Kanjûrô in Sawamura Bunji's kaomise drama "Inari Yakata Manpô no Kura", which was produced by Arashi Koroku I at Hayagumo Chôdayû's theater. 1st lunar month of 1731: Kazaemon's rank in the Kyôto hyôbanki, katakiyaku section, was jô-jô (superior - superior). 11th lunar month of 1731: Kazaemon became jitsuaku and performed in Kyôto at Miyako Mandayû's theater in the kaomise drama "Hiragana Imagawajô". 9th lunar month of 1732: first Kabuki adaptation of Matsuda Bunkôdô and Hasegawa Senshi puppet theater drama "Dan no Ura Kabuto Gunki", which was produced in Kyôto by Sakakiyama Shirotarô I at Miyako Mandayû's theater; Kazaemon played the roles of Iwanaga Saemon and Hanaôgiya Toheiji [casting]. 11th lunar month of 1732: Kazaemon played in Kyôto at Kameya Kumenojô's theater in the kaomise drama "Hayazaki Kogane no Hanabusa"; his stage partners were Ichiyama Sukegorô I, Arashi Kanshirô I, Nakamura Kiyosaburô I, Somenoi Hanshirô, Matsushima Moheiji, Kirinami Takie, Fujioka Daikichi, Tomizawa Montarô I and Arashi Koroku I. 1st lunar month of 1733: Kazaemon's rank in the Kyôto hyôbanki, jitsuaku section, was jô-jô-(shiro)hankichi (superior - superior - (white) half excellent). 11th lunar month of 1733: Kazaemon played at Kameya Kumenojô's theater (Kyôto) the role of Ebira Manzô in the kaomise drama "Chôseiden Kogane no Shikigawara", which was produced by Sakakiyama Shirotarô I. 11th lunar month of 1737: Kazaemon performed in Kyôto in the kaomise drama "Yamato Uta Kamiyo no Kagami", which was produced by Mizuki Tatsunosuke II (who celebrated his shûmei) at Hayagumo Chôdayû's theater; his stage partners were Anegawa Shinshirô I, Segawa Kikunojô I , Segawa Kikujirô I , Yamanaka Heijûrô I, Arashi Sanshirô III and Somenoi Utamatsu. 11th lunar month of 1739: Kazaemon played in Kyôto in the kaomise drama "Muromachi Dono Chôhô Denki", which was produced by Sanogawa Ichimatsu I for the nadai Miyako Mandayû; his stage partners were Yamanaka Heijûrô I, Ôtani Hiroji I, Sawamura Otoemon I, Tamiya Shirogorô, Haruyama Genshichi II, Onoe Kikugorô I, Asao Motogorô I, Matsumoto Tomojûrô I and Arashi Sanshirô III. 1st lunar month of 1740: Kazaemon's rank in the Kyôto hyôbanki, jitsuaku section, was jô-jô-kichi (superior - superior - excellent). He shared the same rank with Mihogi Gizaemon I and Yashio Ikuemon. Kazaemon played the role of Kanzaki Kageyu in Kyôto at Miyako Mandayû's theater in the ni-no-kawari drama "Keisei Fugen no Minato". 8th lunar month of 1741: the play "Shin Usuyuki Monogatari", which was originally written for the puppet theater, was adapted for Kabuki for the first time, in Kyôto at Hayagumo Chôdayû's theater; Kazaemon played the role of Kuniyuki [casting]. 11th lunar month of 1743: Shinozuka Kazaemon took the name of Shinozuka Jirozaemon II at the Naka no Shibai, playing the role of Inazu Saichi in the kaomise drama "Shiki Samba Ôgi Ikusa", which was produced by Anegawa Shinshirô I; his others stage partners were Nakayama Shinkurô I, Yamashita Matatarô I, Fujikawa Hanzaburô II, Arashi Koroku I, Yoshizawa Sakinosuke II, Bandô Toyosaburô I, Yamanaka Heijûrô I, Arashi Koizô I and his adopted son Shinozuka Utagiri. 11th lunar month of 1746: he took back the name of Shinozuka Kazaemon and performed in Kyôto in the kaomise drama "Taihei Asahi no Shirahata", which was produced by Asao Motogorô I; his stage partners were Fujioka Daikichi, Sakurayama Shirosaburô II, Yamanaka Heijûrô I, Mihogi Shichitarô and Tatsuoka Hisagiku. 1750: tour in Ise and in the Owari province; Kazaemon was the zamoto of a travelling troupe. 1751 (? ): Kazaemon most likely died in Ôsaka. Shinozuka Kazaemon was a popular Kamigata jitsuaku/katakiyaku actor, who was active during the first half of the 18th century. The 23rd day of the 1st lunar month of the 3rd year of the Kyôhô era was the 22nd of February 1718 in the western calendar. 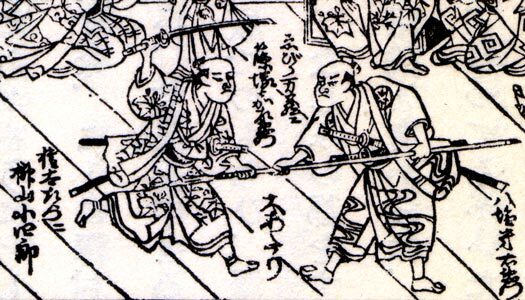 The Segawa brothers were back in Kyôto after several seasons spent in Edo.